Calif. Voters Decide To Uphold Death Penalty, Streamline The Process : The Two-Way California voters rejected a ballot measure that would have abolished capital punishment, and narrowly approved a competing measure designed to speed up the execution process. 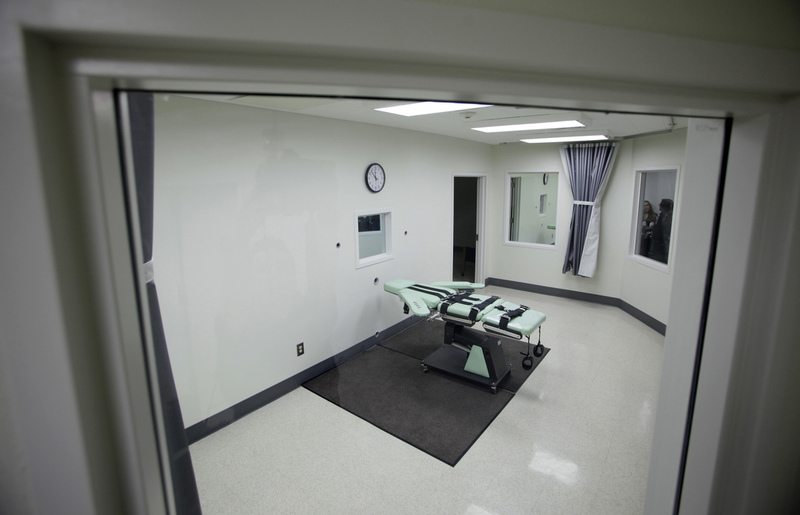 The interior of the lethal injection facility at California's San Quentin State Prison in 2010. On the other hand, supporters of Proposition 66 campaigned under the slogan "mend it, don't end it," as member station KPCC reported. The measure passed with 51 percent of the vote. It "limits death penalty appeals and sets strict timelines for state court rulings in capital cases," as NPR's Richard Gonzales told our Newscast unit. Proposition 66 is also "intended to speed up executions by designating trial courts to hear petitions challenging death row convictions, limiting successive petitions and expanding the pool of lawyers who could take on death penalty appeals," as The Los Angeles Times wrote. Critics of the measure say making appeals faster "increases the chance of executing an innocent person," as KQED's Scott Shafer reported on Weekend Edition Sunday. He spoke with Santa Clara University law professor Ellen Kreitzberg, who said "the danger with 66 is it does limit and narrow the ability to present newly discovered evidence, which is how most of these innocence claims are presented in court." Proponents of abolishing California's death penalty argued that the system is broken beyond repair. As KPCC reported, the current status quo can be summed up like this: "[D]eath sentences are occasionally handed down but no condemned inmates are executed." "No one has been executed in the past ten years due to court disputes over procedures for lethal injections," Richard reported, though 750 prisoners are currently on death row. In a statement following the vote, the Yes on 62 campaign said that "the high costs will continue to add up, the backlog of cases will continue to mount and the stories of injustice will continue to be heard." In 2012, California voters rejected another measure to abolish the death penalty by four percentage points, as Richard reported. Two other states also voted to support capital punishment. According to The Associated Press, Nebraska voters "rejected a death penalty ban," while Oklahoma voters "by about a two-to-one margin approved a state question guaranteeing the use of the death penalty and allowing lawmakers to designate any method of execution that is not banned by the U.S. Constitution."